Traveling as a vegetarian can sometimes be tricky, especially in certain regions of the world. 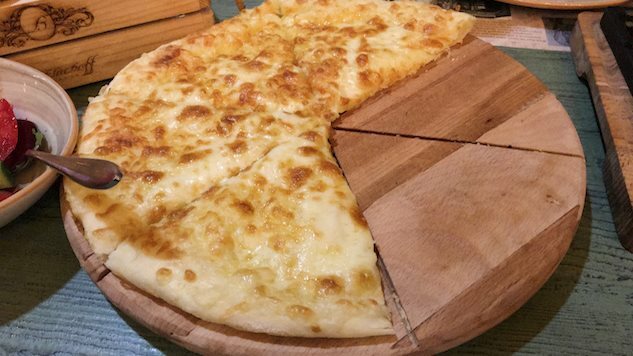 Imagine a pizza, but with even more cheese: that’s the Georgian dish khachapuri. Traditionally made with leavened bread dough that’s filled with cheese and then baked, there are multiple variations, including one with potatoes, one with extra cheese on top and one where the dough is formed into a boat-shape, filled with melted cheese, and topped with an egg and butter. Khachapuri is so popular (for obvious reasons) that it’s spread to other countries in the region, and is commonly found in Armenia, Russia and Israel as well. dates back to the 1500s and was filled with tarragon, but now you can also find cottage cheese, poppy seed and apple, among others. The dumplings can be fried or baked, but are often served boiled with sour cream on top. Once you’ve tried this Croatian specialty, you’re going to regret all those years you threw out your pumpkin seeds after carving jack-o- lanterns. Pumpkin seeds and pumpkin seed oil are common in northern Croatia, and one of the most delicious ways to use them is in this nutty, garlicky pesto. If you’re in Zagreb, be sure to check out the version at Heritage Croatian Foods. vegetarians, who can choose between spinach, potatoes and cheese in their burek. This Czech specialty is more or less a grown-up version of mozzarella sticks, and who doesn’t want to eat mozzarella sticks for a meal? Edam, a local cheese, is battered and fried, and then served up one of two ways: either on a bun, hamburger-style, if you’re grabbing it from a street cart; or on a plate with some form of fried potatoes, and maybe a vegetable if the place is fancy. And no matter where you order, it always comes with tartar sauce.